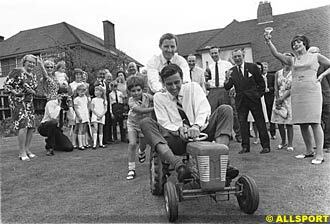 The 1967 season was to be Jim Clark's last full year in racing. The tumult created by entering the 3 litre era continued apace but both Clark and Gurney fared better than they did in 1966. The South African Grand Prix was held for the first time at the Kyalami circuit near Johannesburg on January 2nd 1967, but although the course was new the cars were not. Ferrari was concentrating on taking the fight to the Ford GT40's in sports car racing and did not even put in an appearance for South Africa. Lotus had retained the services of Graham Hill for 1967 and he and Clark ran Lotus 33's with the BRM H16 engine, while development continued on the Lotus 49 with the new DFV Cosworth-Ford V8. 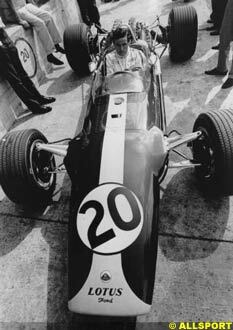 Gurney's Eagle still had the 4 cylinder Coventry Climax. The driver lineup for BRM was Jackie Stewart and Mike Spence. Pedro Rodriguez drove for Cooper-Maserati and local Rhodesian driver John Love entered an aging 4 cylinder Cooper-Climax used in the Tasman series. As the race unfolded, Denis Hulme in the Brabham BT19-Repco was well in the lead when he had to pit for brake fluid, when the lead passed to local driver John Love in his Tasman Cooper. Clark had a lively race but to no avail. He spun the car early in the race and had to work his way back to the front, gradually getting back to third where he spun again and retired from the race, his engine having overheated. Meanwhile, Love continued to lead until on lap 74 of the 80 lap race when he had to pit for fuel. This pit stop allowed Mexican Pedro Rodriguez to slip by Love and into the lead, giving the Cooper marque its last win, and in dramatic fashion. 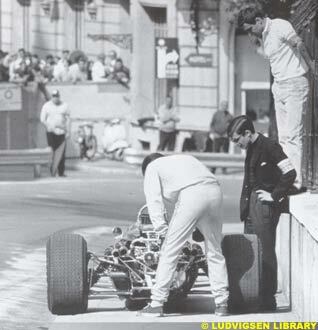 The next race, the Monaco Grand Prix on May 7th 1967, was marred by tragedy: an accident at the chicane involving Lorenzo Bandini, who had been leading the race at half distance. 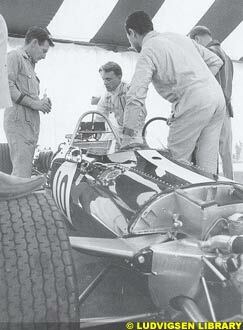 Ferrari had entered three V12's for Bandini, Scarfiotti and a young New Zealander named Chris Amon. At that time the Monaco race was 100 laps. By lap 84, Bandini was closing in on second place when he lost control of his Ferrari, which overturned after hitting the hay bales and caught fire just past the chicane on the waterfront. The Ferrari burned to the ground and Bandini died from his burns a few days later. Hulme won the race with Hill second; new Ferrari driver Amon finished third. 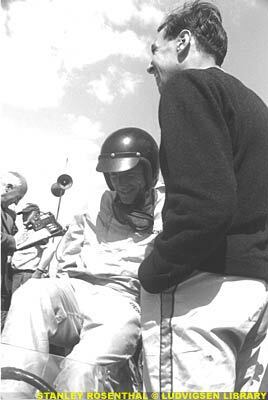 Clark and Gurney went out with mechanical failure. Once again, the Indy 500 was scheduled early in the Formula One season, between the Monaco and Dutch Grands Prix. On Saturday, May 16th 1967, Gurney put his Eagle-Ford in the middle of the front row, next to Mario Andretti who had pole position. The other members of the Formula One contingent did not fare as well as Gurney. Stewart and Hill found themselves in the last two rows of the 33 car field and Jochen Rindt had also qualified badly in his Eagle-Ford; even Jim Clark found himself tested, qualifying only 16th in the STP Oil Treatment Special Lotus-Ford. The story of the race though, which was held on Tuesday, May 30th 1967, was "Silent Sam", the STP Turbine car driven by Parnelli Jones, which had led for 171 laps, emitting a Great Whooshing Sound as it sped down the front straightaway, until, with just 3 laps left, Jones coasted into the pits and retired from the race, the victim of the proverbial five dollar broken transmission part. A.J. Foyt inherited the win from the Turbine in his Lotus 38-based Coyote, the first victory for a Goodyear shod car at Indy since 1919. The race ended curiously, red-flagged on lap 200, the last lap, after a multi-car crash that left cars strewn all over the front straight, with A.J. Foyt gingerly picking his way through the wrecked cars to emerge from the smoke as the winner. The Formula One group had one of its worst years; Denis Hulme in one of Gurney's Eagle's was able to finish fourth, the rest of the group ended up in the lower half of the field. But Gurney's proudest moment in the sun was to be the Belgian Grand Prix on June 18th 1967, where he set fastest lap and the dark blue Eagle Weslake No. 36 with its white racing stripe won its one and only race: if you can win only one Grand Prix in a car of your own manufacture, why not Spa! Clark had qualified on pole turning in the first 150 mph average speed lap at Spa during practice and hoped to repeat the success the Lotus 49 had enjoyed at Zandvoort. But the DFV's plugs kept fouling and Clark was in and out of the pits, ultimately finishing sixth. Stewart's BRM H16 then looked like it might win its second race but Stewart was forced to nurse the car home due to a transmission glitch, which allowed Gurney this historic victory, the high-water mark for All American Racers in Formula One, made all the more remarkable by the fact that Gurney and Foyt had won LeMans in the Ford GT 40 only a week earlier. The 1967 French Grand Prix was held at LeMans on July 2nd 1967, not the real LeMans circuit but the twisty "Bugatti Circuit" laid out on a track that was a combination of the front straightaway and the Dunlop curve of the LeMans sportscar circuit and the huge LeMans parking lot. The idea was similar to the concept that led in the Year 2000 to the Indianapolis Motor Speedway incorporating a twisty bits, purpose-built infield circuit, with part of its famous oval track to come up with the Formula One circuit that is now the permanent home for the U.S. Grand Prix. But at LeMans the idea did now work out as well, the drivers and engineers did not take to the unimaginative series of slow hairpin bends in the parking lot portion and worse, unlike Indy 33 years later, the spectators did not come. Modern Formula One never returned to LeMans. Hill was on pole but Clark soon had the lead until his ZF transmission failed on lap 22 and he was out of the race; the same failure put Hill out too. In this tortoise-and-hare kind of year, the Old Reliable Keep-It-Simple tortoise team of Jack Brabham and Denis Hulme in their Brabham BT 24's finished first and second in the French Grand Prix, while the hare team, the Lotus-Ford's, wore themselves out early, not the first or last time this would happen in 1967. Gurney's LeMans luck had dried up and his Eagle was out at half-distance with fuel system problems. On July 15th 1967, however Lotus was back on home ground for the British Grand Prix at Silverstone, where Clark took pole and Graham Hill was right next to him on the front row, having narrowly escaped injury during practice when the Lotus 49 suspension let go and he hit the wall. In the race, Hulme set fastest lap in the Brabham BT24 and finished 13 seconds behind Clark, with Chris Amon's Ferrari and Jack Brabham's Brabham nip and tuck for the next two spots. 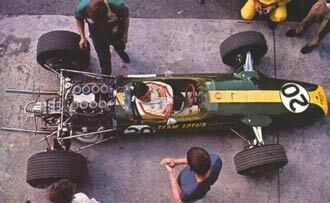 Graham Hill's rebuilt Lotus lost a suspension bolt and although he gamely tried to rejoin the race it was to no avail. The clutch on the Eagle gave up at 33 laps of the 80 lap race leading to another non-finish for Gurney. For Clark, it was his fifth win in the British Grand Prix. Symptomatic of the ebbs and flows both Clark and Gurney experienced in 1967, at the Nurburgring on August 6th 1967, the Eagle-Weslake was flying, with Gurney taking the lead from pole-sitter Clark when the Lotus went out with tire/suspension trouble on the fifth lap. But on lap 13 of the 15 lap race, the Eagle's half shaft snapped and Gurney too was out, allowing Denis Hulme in the Brabham BT24 to win ahead of his boss Jack Brabham, another strong finish for the Brabham team. On August 27th 1967, the inaugural Canadian Grand Prix at Mosport was held under miserable conditions. Clark led for much of the race until the failure of his ignition system in the teeming rain. Brabham and Hulme turned in their customary 1, 2 finish, with Gurney posting a creditable third under difficult conditions. This Mosport race is also remembered as the race where Bruce McLaren introduced his new McLaren M5A, with a distinguished pedigree: a monocoque designed by Robin Herd and a new V12 BRM engine designed by Tony Rudd. The Italian Grand Prix at Monza on September 10th 1967, was one of the races for which Jim Clark is most remembered, even though he did not win it. Clark qualified on pole and took the lead in the opening laps. But then Clark's tire had a puncture, he made a pit stop to replace the tire and by the time he rejoined the race he was in 15th place and a lap down to the field. While Clark was back in the tail end of the field trying to make up for lost time, Lotus teammate Hill inherited the lead from Clark. By lap 59, Clark had fought his way back to second place. By lap 58 of the 68 lap race, Hill's engine failed him and, incredibly, Clark found himself again in the lead, setting the fastest lap on his way back to the front. But right behind Clark was Jack Brabham, who was engaged in a slipstreaming battle with prior Monza winner John Surtees who was driving the so-called "Hondola," the new Honda RA 300 V12 designed by Eric Broadley of Lola which borrowed much from the Indianapolis Lola's of the period and was making its debut at this race. Gradually, the slipstreamers were catching up to Clark and on the last lap, as all three cars were in the Curva Grande, Clark's Lotus ran out of gas and lost power and the Honda and Brabham swept by and were side by side as they came into the final turn, Parabolica. Brabham tried to muscle his way to the inside of Surtees as the two cars were on the limit around the agonizingly long Parabolica curve, which set the cars up for the main straight. Having failed to get inside of Surtees, Brabham tucked in behind him, hoping to slingshot out ahead on the straight but that tactic failed and Surtees won in a photo-finish by half a length, .02 seconds in the record books. Clark still managed third place, coasting in 23 seconds behind the leaders in yet another race he should have won. By the time the U.S. Grand Prix was held on October 1st 1967 at Watkins Glen, the supremacy of the Lotus 49 was apparent to one and all but the less exotic Brabham team was plainly the more consistent performer throughout the year. In the U.S. Grand Prix, the Lotus 49's were again on the front row: Hill took pole and Clark was beside him. Hill was in the lead for a time until he began to slow due to clutch problems, yielding to Clark, who, although he had his own problems with his rear suspension losing a bolt, nursed the car home in first place, ahead of teammate Hill by six seconds, finally vanquishing the Brabham's but too late in the season to turn the tide. In the Mexican Grand Prix on October 22nd 1967, Clark was again on pole, with Chris Amon's Ferrari beside him and Dan Gurney's Eagle right behind Clark. When the starter gave a false signal and hesitated, so did Clark, and Gurney accidently rammed the rear of the Clark's Lotus, which damaged the Eagle's radiator and put Gurney out of the race but left Clark's Lotus unscathed. Hill took the lead in the early stages, but Clark had put himself in first place by lap 3, with Hill ultimately being forced to retire on lap 17 of the 65 lap race due to a transmission problem. Typifying the 1967 season, the Brabham twins finished second (Brabham) and third (Hulme), which clinched the Drivers' Championship for Denis Hulme and the Constructors' Championship for the Brabham team. 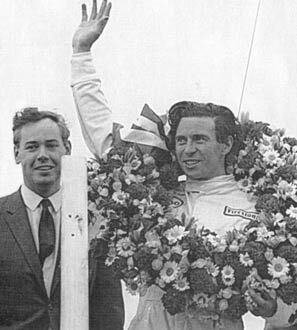 Although the Lotus 49 and Clark had been beaten, Jimmy Clark had one satisfaction: his victory in Mexico was his 24th Grand Prix win, putting Clark even with the great Juan Manuel Fangio. Previously: Part I | Part II | Part III | Part IV Next Week: 1968 - Final.